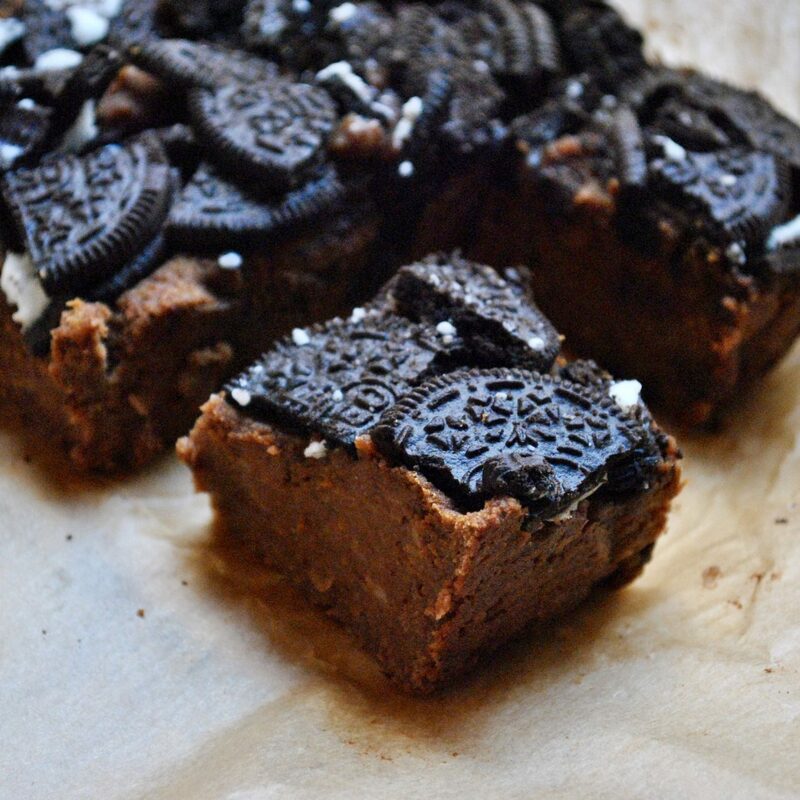 For Christmas dinner with my uni housemates, I challenged myself to come up with an exceptional dessert that all my friends would enjoy, whilst being relatively healthy, dairy-free and entirely vegan. 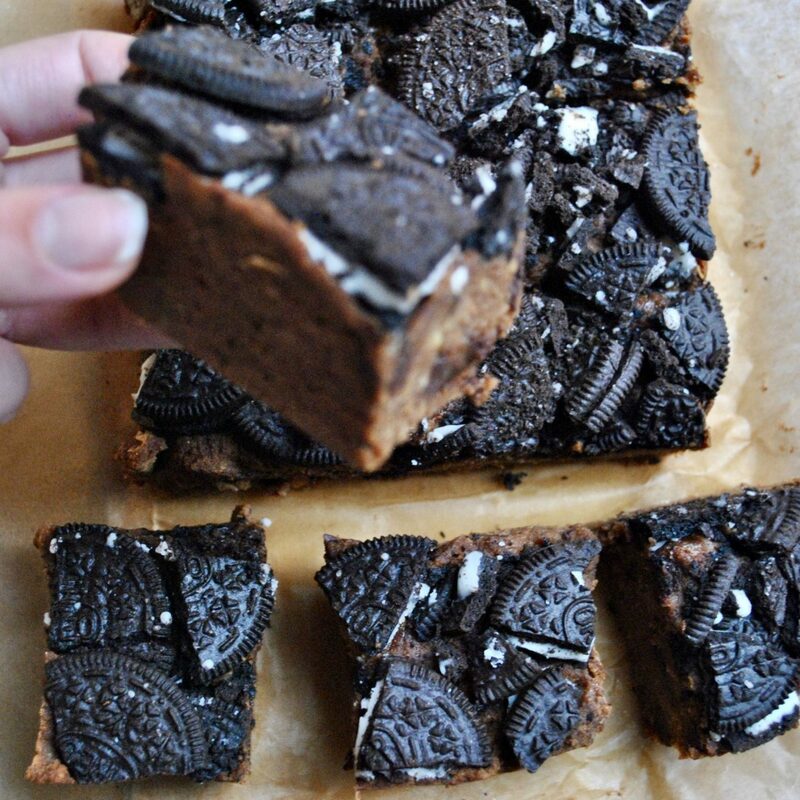 The result: wonderfully rich and fudgey chocolate brownies, finished with roughly chopped Oreos. 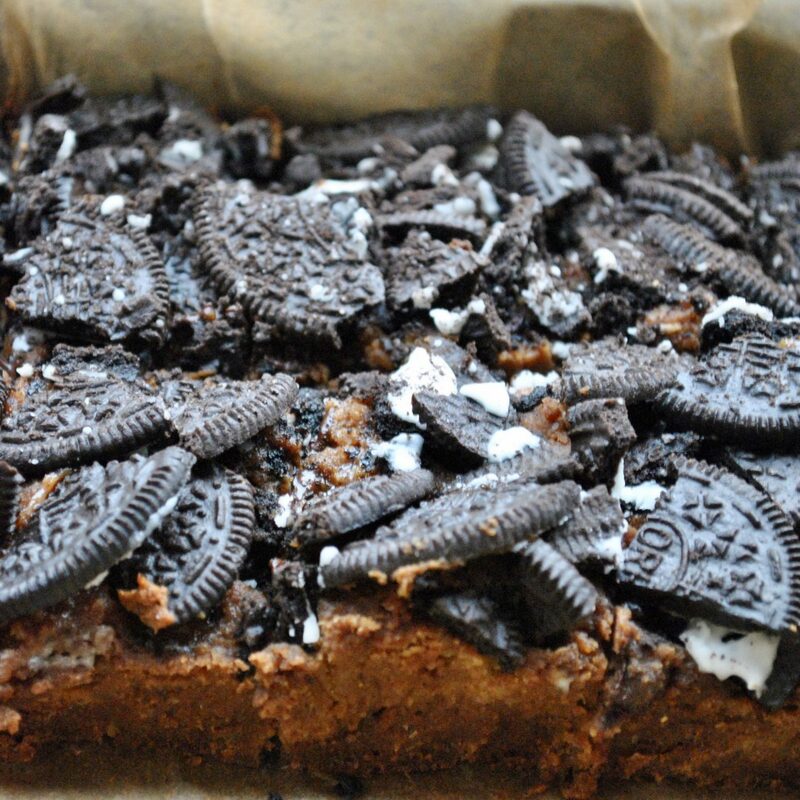 If you leave out the Oreos (or replace with suitable cookies of choice) these are also gluten-free and refined sugar-free! I used gooey Medjool dates to sweeten them (instead of nasty sugars and artificial sweeteners), and the nutritious twist continues with a load of fibre in each bite, thanks to the chickpeas – YES, CHICKPEAS. But if you’ve tried my Chocolate Chip Blondies with a Secret Ingredient, then you’ll know how incredibly well chickpeas work in baking! They are totally undetectable (given that you blitz the mixture well enough) and give the most heavenly texture to sweet treats. Oh and if you hadn’t already guests, these were a mega-hit among all my friends! If you like these brownies, you will LOVE my Flourless Triple Chocolate Cake with Sticky Toffee Frosting and Salted Caramel Popcorn, 2-Minute Chocolate Protein Mug Cake, Raw Protein Brownies and Chocolate Peanut Butter Jelly Cups! Add the dates, coconut oil, vanilla extract, maple syrup and milk to a food processor and blend until a smooth mixture forms. Add the chickpeas and blend again until fully combined. Pour the mixture into a large bowl, then stir in the oat flour, baking powder, cacao and salt. Transfer into a small greased cake tin. 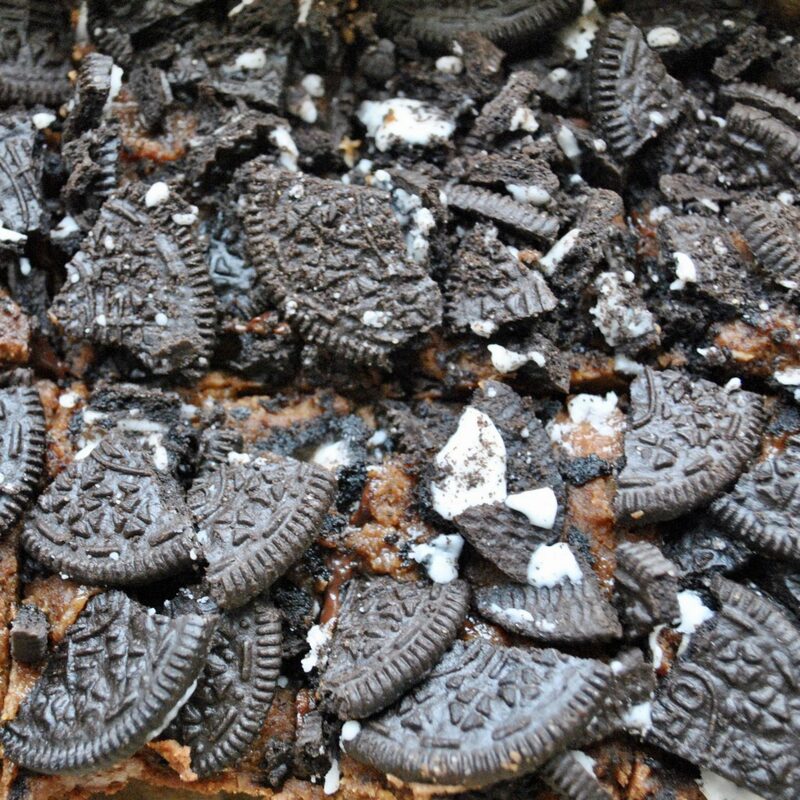 Roughly chop the Oreos, sprinkle them on top and lightly press down into the batter. Bake for 25 minutes, then leave to cool completely before slicing. 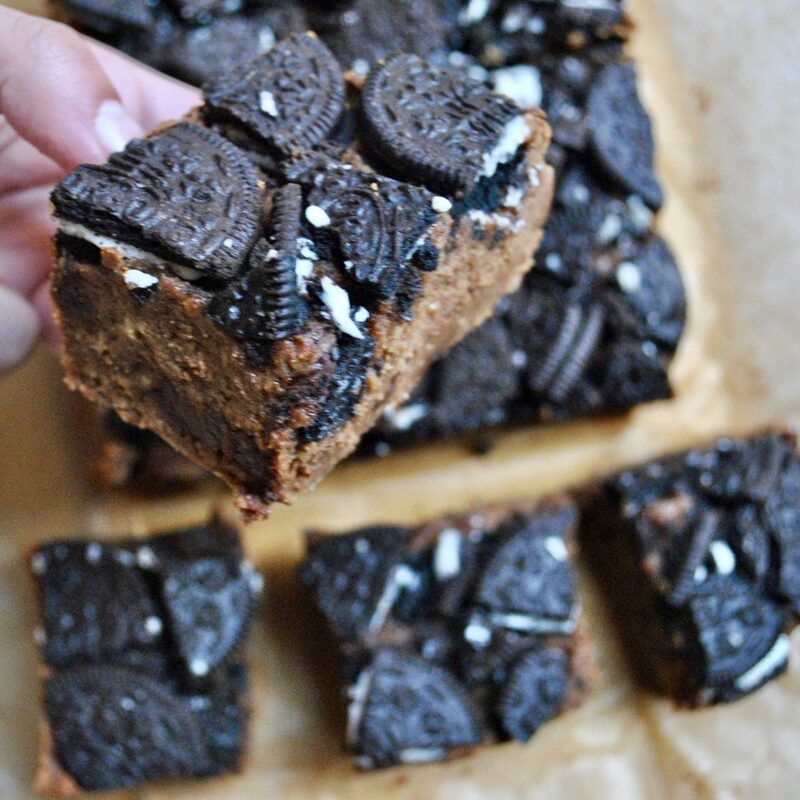 Don’t forget to tag me on Instagram @cerealandpeanutbutter if you make this recipe – I LOVE seeing your recreations!